Working on the post to get us going again, I don`t have expectations over the weekend though as I am at my flakiest on the weekend. The following is based on my research of Thanagarians, their Nth-Metal, and mashes up the Justice League Unlimited versions (with inborn wings instead of a harness, and the idea of reincarnation) with Marvel's history of Apocalypse and Ancient Egypt into a seamless whole. 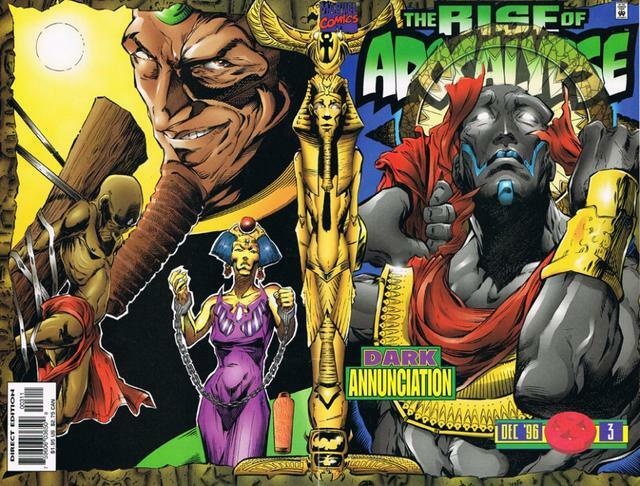 3100 years before the birth of Christ, a Thanagarian warlord named Ra discovered Earth and the humans beginning to colonize the fertile Nile basin in what was then the land called Khem. With him came his family and fleet and they established a mining outpost, conquering the the population but bringing civilization to the region including hieroglyphic writing, agriculture and advanced stone-work. The people worshiped him as god, merging the alien's symbolism of the Hawk with their Sun-God Aten. The Thanagarian dynasty ruled in peace for 150 years. In 2950 BC, Nathaniel Richards aka Kang the Conquerer, descendant and father of Reed Richards and/or Victor Von Doom (try not to think about it too hard) arrived from the 30th Century AD. 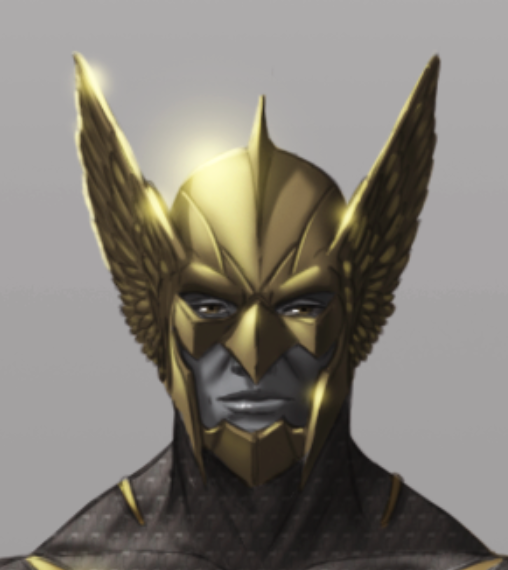 Restyling himself Pharaoh Rama-Tut, he used his superior technology and knowledge of the future to depose Ra, imprisoning the Thanagarian prince Katar-Hol and his consort Chay-ara as political hostages. Richards had come back in time to seek out En Sabah Nur, the world's first mutant who was destined to enslave the Earth. Richards hoped to take the first mutant under his guidance and therefore control, but a being named Baal discovered Nur first and hid him away, revealing the hidden technology that had given the Thanagarians and Rama-Tut their seemingly god-like power. 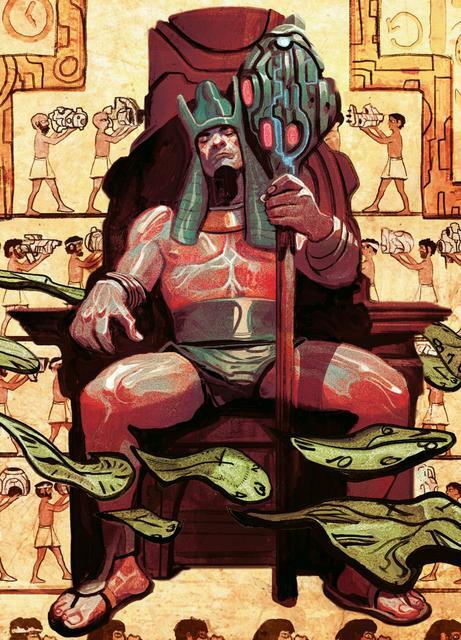 As he grew in power En Sabah Nur was able to fight back against the oppressors of Khem, first enslaving Rama-Tut's general Ozymandias before turning his attention to Rama-Tut himself and his High Priest, Hath-Set. During a final raid upon the royal palace, Nur and his followers, freed the last two imprisoned Hawks who wasted no time in aiding their liberator. However in the final pitched battle Katar-Hol was struck down by Hath-Set with an Nth-Metal dagger to the back. Chay-ara smote down ruin upon Hath-Set, but after in her grief took her own life with that same dagger. Thus marked the end of the Thanagarian dynasty on Earth, a scant 200 years after it had started, and the rise of En Sabah Nur and the Akkaba in ancient Khem. Nearly 5,000 years later, separated and locked into an endless cycle of reincarnation, the twin souls of the Thanagrian lovers were reunited. Human Egyptologist Carter Hall discovered a previously unknown and untouched tomb. Therein he came across a dagger made of strange metal and inexplicably preserved against the corrosive ravages of time. The moment he touched the metal a surge of awareness flooded into him, and he remembered once more his true nature, and his bloody end. He also realized that his long-lost beloved is right there on Earth, a founding member of the Justice League who goes by the alias Hawkgirl. Hall endeavored to reach her, with what amounted to essentially stalking, and at first Chay-ara, now going by the name Shayera, and the rest of the League took him for a dangerous madman. However upon realizing his dagger is Nth-Metal and confiscating it, she too was awakened to her ancient soul. 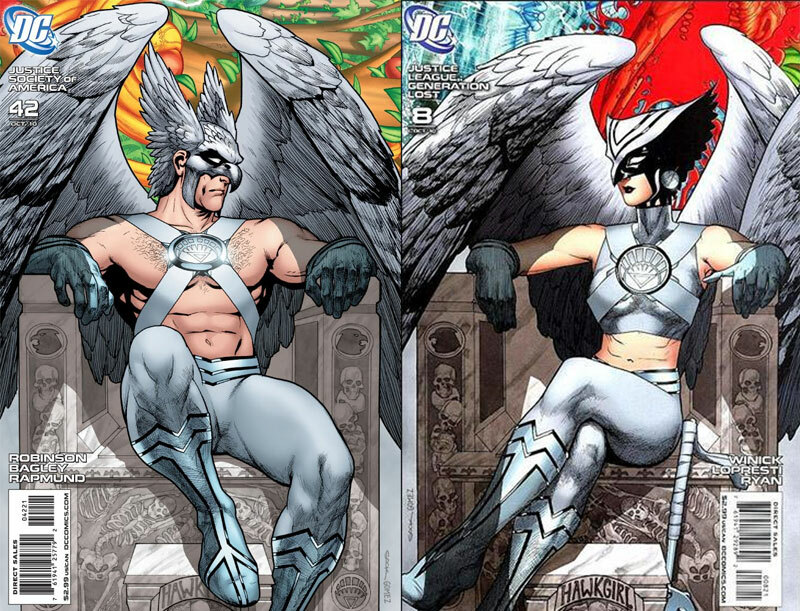 The two lovers reconciled, and the now-human Carter used Thanagarian Nth-Metal to fashion himself a winged suit in order to fight alongside his soulmate as Hawkman. 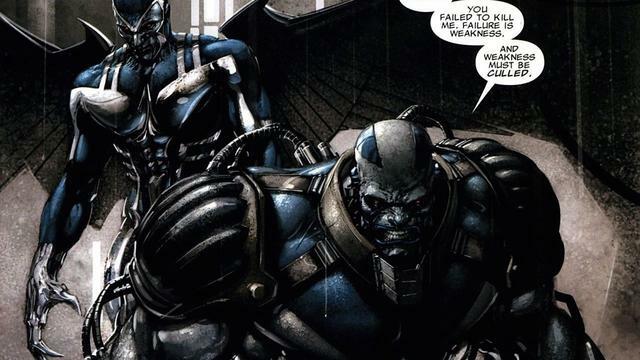 When Horus was only 18, En Sabah Nur, now known as the genocidal villain Apocalypse, rose again to threaten the world. 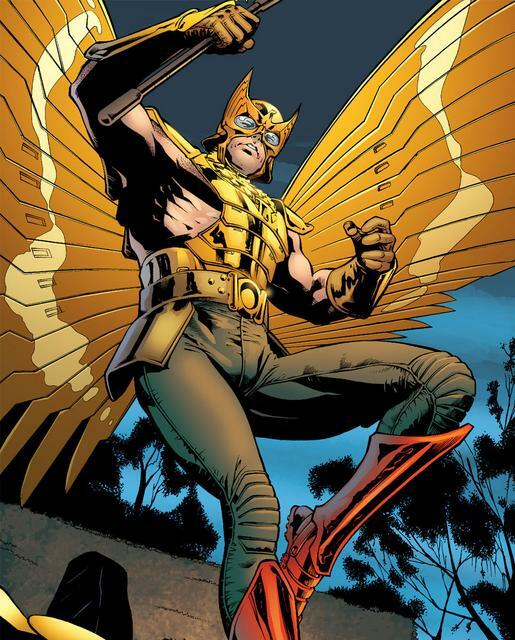 He approached his former allies, Hawkman and Hawkgirl, seeking to enlist their help once more. However they recognized his true evil and refused. In anger and revenge, Apocalypse captured their son. Using the vast Celestial technology of his Ship, Apocalypse brainwashed Horus, augmenting his body with a techno-organic form of Nth Metal and turned him into the leader of his four Horseman, the Archangel of Death. Several years passed, Horus-now-Death fighting many tragic battles against the Justice League and his own parents. Eventually Apocalypse was defeated by X-Force and rescinded from the world once more and Horus is rescued, though still under the mad thrall of his former master. Bereft and with nowhere else to turn, his parents surrender their son into the custody of Professor Xavier and Oracle who oversee the Justice League Academy. 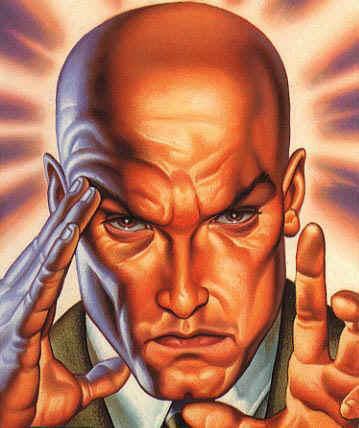 With painstaking psychic surgery, Xavier is eventually able to cure Horus of his madness, though in the process much of his memory was erased along with the Death identity. 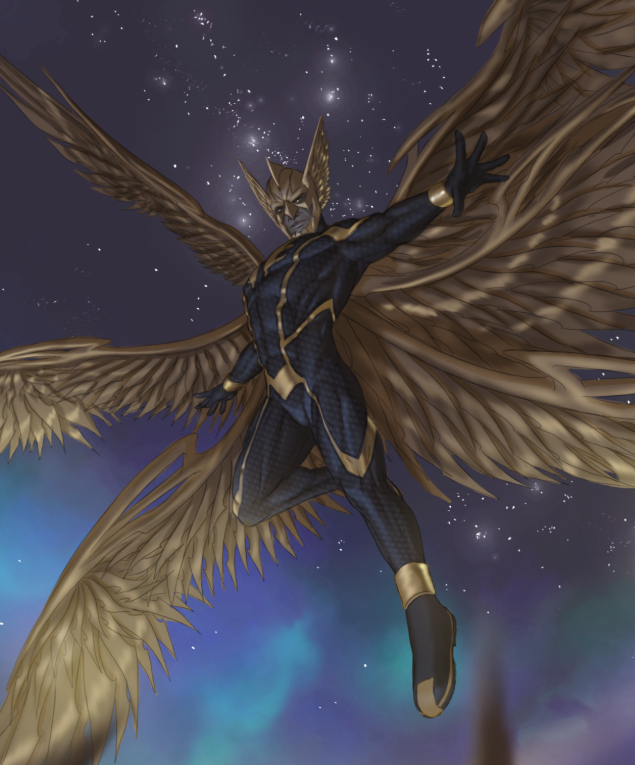 Horus was rechristened by the aging Warren Worthington III as his successor, Archangel II, and served many years on various teams, from the X-Men's Gold Team, to the clandestine X-Force, but refused to join the Justice League or face his parents out of shame. When the Phoenix Force threatened to destroy the Shi'ar Empire, both the X-Men and the Justice League are called to battle. Finally reconciling with his parents, Horus accepts their forgiveness. After being given a Thanagarian Hawk helmet by Shayera that will ensure her son's mind is never tampered with again, he takes on the new moniker Hawkangel, once more embracing his heritage. 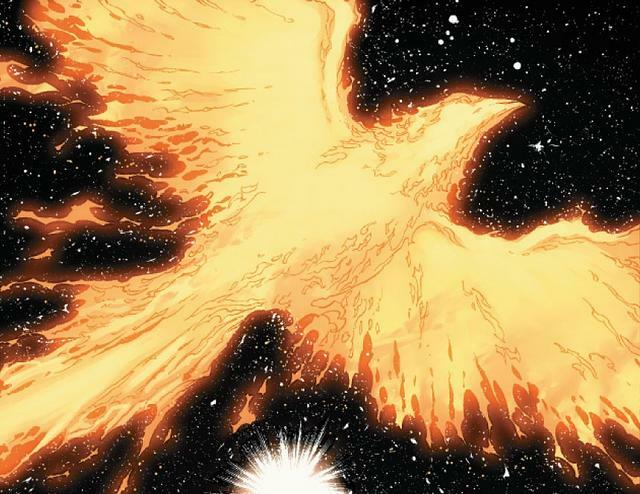 However many heroes perished in the pitched fight against the mighty Phoenix, and Horus is presumed one of the casualties after the cosmic destroyer immolated a solar system. 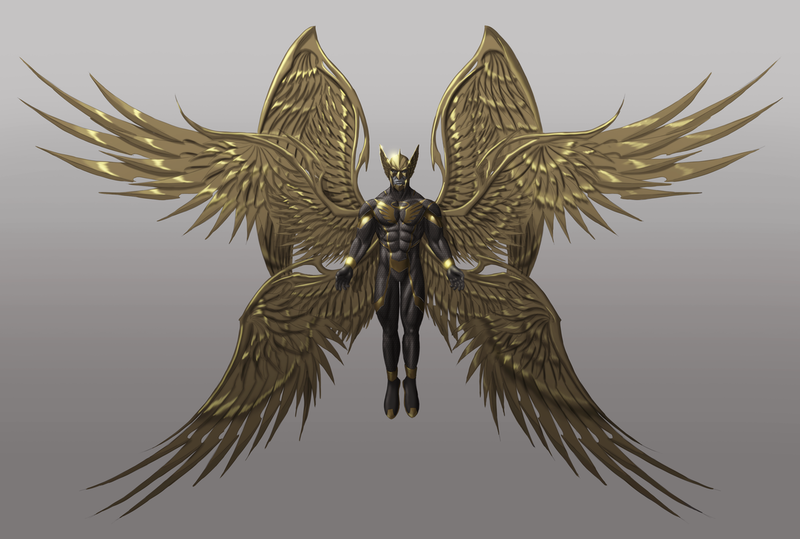 Horus was born Half-Thanagarian, giving him greater than peak human strength, hollow bones, glorious feathered wings, and the enhanced muscular and bone structure required to support them. He has enhanced hawk-like vision and can spot a target from many miles away, as well as being adapted for survival in extreme temperatures and the thin atmosphere of high-altitudes. 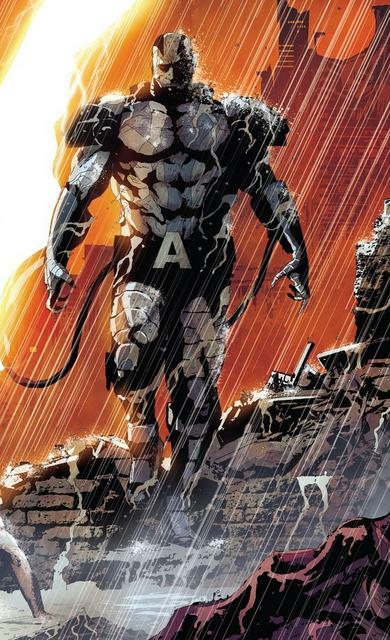 The modifications instilled by Apocalypse's Celestial technology include replacing his wings with retractable Nth-metal versions made up of thousands of razor-sharp feather-like blades whose strength and sharpness rival adamantium. With these formidable appendages he is capable of devastating cutting attacks, or of using the expansive limbs to shield and deflect almost any direct assault. In addition, his bones have been replaced (not merely laced) with hollow Nth-metal which stores the liquefied Nth-Metal of his wings while they are retracted. Much of his connective tissue has been replaced with the mysterious, mystical metal as well, including the tendons and ligaments holding him together, and his blood is based on Nth-metal, not iron. Nth-Metal has several unique properties. The most obvious are it's antigravity applications, allowing for sustained hovering and flight at mach speed. He is capable of throwing off the bladed feathers as flechettes which extend his gravitic control to other targets. Of particular note is Nth-Metal's tendency to disrupt the more arcane energies of the world, rendering Horus completely immune to magic. With effort he can extend this counter-resonance of his wings into a powerful anti-magic pulse. Thanagarians have also long enjoyed the regenerative effects of Nth-Metal, using it to lead lives of superior health and span. Due to it's unprecedented integration with his body Horus now possesses this function as well, though it requires his wings to be fully retracted inside his body to take effect. He is also somehow able to extend these regenerative properties in order to heal others, or even resurrect the recently deceased! 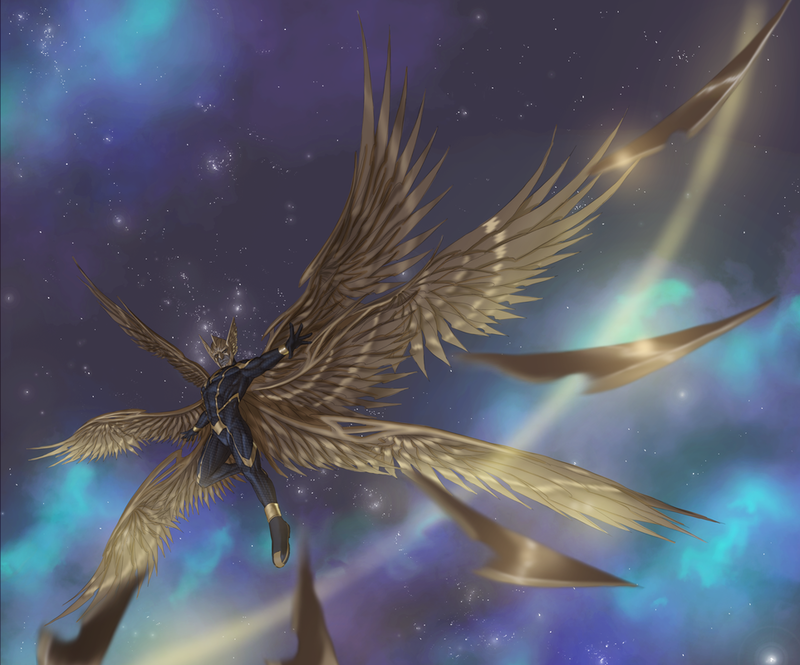 Indeed Horus's soul is bonded with the Nth-Metal of his wings, meaning that so long as they remain intact he is effectively immortal. Finally, while deployed, Hawkangel's wings can wrap tightly around him, melding into an armored sarcophagus that effectively turns him into a human-sized spacecraft, capable of interstellar travel. Aside from being nearly impervious to damage, this form allows him to drop into the prolonged stasis that enabled him to survive the centuries adrift in deep space. Altogether his capabilities make Horus a frightening combatant, especially when he is able to take full advantage of the mobility of flight. Nth-Metal is mysterious even to the Thanagarians who discovered it, and it is possible in time even more applications of this wondrous element will be discovered. Physically Horus is imposing standing at 2 meters tall. The alterations performed by Apocalypse have turned his skin the same gray as his "benefactor." His sclera are black, while his irises and hair shine with the same dull burnished gold as his wings, skeleton, teeth, and nails. He wears a costume primarily of a glossy graphite with large bands of gold on the arms and legs. These bands converge on his chest into a large stylized wings that curl up, forming a circle around a central ring. He also wears an N-th-Metal helmet of ancient Thanagarian design that renders him immune to further mental subordination. His wings are of course his most immediate and impressive feature, with up to 3 pairs able to be deployed for a total of 6 that when fully spread give him an awe-inspiring wingspan of 30' feet from tip to tip. Interestingly his ability to fly stems from the antigravity property of the Nth-Metal rather than any thrust provided by flapping. In personality Horus is no longer the man he once was. As a adolescent he was bright, precocious, curious, and always eager to help. During his time as the Horseman of Death, his personality was all but completely dissolved under the iron will of Apocalypse. Through careful psychic surgery much of memories have been restored but he views them from a detached distance. His inability to relate as he once did has left him a brooding figure, ever wary that the programming instilled in him might one day resurface, or worse should Apocalypse return. It is no secret that he bears a great burden of guilt for his time as a supervillain and mass-murderer. Nonetheless he is loyal to a fault, and has no trouble integrating in a team environment. However there are still lingering traces of the Death program, and in the heat of combat his temper has been known to flare. It is no wonder he keeps such an iron-grip of control over himself. Horus bears a terrible stain of guilt for his past crimes, and even though his fellow metahumans have forgiven his actions while under the thrall of the first mutant, he struggles to forgive himself. At one time celebrated and revered as the child of two great heroes, the image of the Archangel of Death has been seared into the zeitgeist and many people now react with abject fear in his presence. The process used by Apocalypse to transmogrify Horus into the Horseman Death wiped clean all of his former memories and identity. While the Professor has been able to restore the latter, Horus still has huge blind spots in his memory and may not recall former friends or enemies alike. The Nth-Metal wings installed by Apocalypse seem to be at least partly organic or techno-organic, and have on occasion exhibited some kind of rudimentary intelligence, deploying on their own in response to any perceived threat with often lethal force. While Horus seems to have a lockdown on them, in rare circumstances they may exert their former programming. Horus has learned to calm the murderous nature of his techno-organic wings by indulging them in the ecstasy of flight. This functions like an addiction that increases the longer he is confined without full winged flight. After a day without taking to the skies, he takes a -1 penalty to all actions, and after 2 days is Impaired at -2 until he can cut loose. In addition he has a more difficult time controlling the wings. If the Complication: A Mind of Their Own would normally have say, a 5% of responding violently to a perceived threat, this increase to 10% after a day, and 15% after two. Aka Kang the Conquerer, aka Nathaniel Richards, aka Scarlet Centurion, aka Immortus, aka Victor Timely, aka Iron Lad, aka Kid Immortus, aka...you get the picture. This time-traveling villain is infinitely dangerous and equally as unpredictable, with as many divergent incarnations as there are realities. Last edited by TekHed on Wed Aug 29, 2018 8:50 pm, edited 35 times in total. if it did, the "Enhanced Flight" dynamic alternate effect would be pointless. I don't think the ring is intended to add 4 ranks of flight to pre-existing. Hm, ok. It's an odd way of doing it. Usually you can buy ranks in different places and they stack, unless expressly limited, but it's not a big deal. Horus is plenty fast! @Bladewind: How's it going Boss? Super well. Been a little busier than anticipated, but post due this evening. I was giving Maverick/ EpicEclipse a chance to respond to a PM. You likey my remake/upgrade of Horus? I added lots of visual aids to the backstory. I was waiting for the game to recommence and have Maverick integrate with the group. Basic vesion; Maverick is from earth where he was an abducted orphan that was subjected to genetic conditioning procedures by a shady group that was attempting to graft powers onto non-metahuman to create their own super-powered assets. Maverick was always a bit too smart for them given his particular training, which had always been considered risky. Maverick wasn't happy with the situation such as it was and had no love for the people who abducted him, subjected him and those like him to painful experimental procedures and then further expected absolute obedience from him, so first chance he got, he let himself be caught by the LSH, taking asylum with them and eventually joining their ranks, putting his super sensory powers and espionage skills to work for a greater cause. 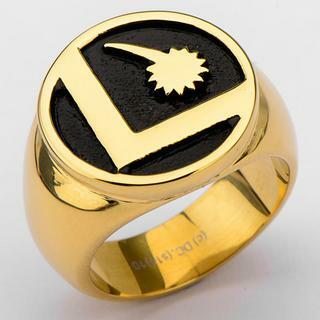 As for a personal connection to the League, he's an orphan from Earth. It is fully possible he's not an Earthling but happens to fall within one of the human-like races that don't necessarily have extra powers, or there is something wrong with his due to the gene treatments. He may have ended up orphaned due to circumstances regarding a Legion-related parent. He'll have also seem training with Legion vets since joining. Indeed. And thank goodness for the visuals to break up the text ! It was, just wanted to know if you had questions. So, post will go up tonight, but be aware I am off the grid for a week. Is Solarhawk a PC or an NPC? Edit: And does anyone else see any opportunities for connection with Horus? Edit 2: I had thought we agreed Horus would've been around for a few weeks or months already? Am I the odd man out new guy again? *Also, a note that Horus wasn't found in a cryo-stasis pod nearly drained of power. He was entombed in his own wings in an Nth-Metal stasis. I added a new alternate effect for his wings which lets him fly and if need be survive in stasis while in Space. Visually this looks like an Egyptian Sarcophagus as the Wings shrink wrap him in am impenetrable shell. Doesn't have any real offensive power beside ramming into things but basically makes him unaging and undying. Note I bought Life Support no sleep, but this is mainly for the mechanical effect of never being unconscious which deactivates sustained powers. From a story perspective he was in a dream state for a thousand years. They'd have also been able to determine by his trajectory and extrapolating speed and time that he came from the Shi'ar Empire's Galaxy. I only purchased Space Travel 2 not 3, which is why even with Space Travel he was still adrift for a thousand years. Edit 3: Where are you headed for the next week? NPC. Fixed the pod thing. No. It's been weeks/ a month since he was found. I see more opportunity with Horus than Bastion, try Dragonmage? I don't share destinations on line until I get back. Superstition. Last edited by Bladewind on Wed Mar 21, 2018 3:58 am, edited 1 time in total. Also, Rachel Palmer is an obscure reference. Just waiting on a reply from Blade before I post to clarify information maverick does or does not know.